“Experts by Experience.” That’s Us! Posted on February 28, 2018 February 28, 2018 Categories advocate, attitude, cancer, chemo, chemotherapy, doctor, lung cancer, port, stage IV, survivorLeave a comment on “Experts by Experience.” That’s Us! Yes. That is so true. We share a commonality that no one wanted and no one asked for and certainly no one sought. And, yet, that monster no one wanted, lung cancer, has brought us together in a way nothing else ever could. And, I think without exception, we are all thrilled to know one another. Have you thought of that benefit? Do you go places where you meet others with a similar diagnosis? In so many ways, it takes another person who has been diagnosed with cancer to understand what it is like. People can imagine or think they know, but only someone who has heard those awful words actually, truly know. I think meeting other people who are surviving cancer helps bring hope to all of us. Maybe it gives just the push someone needs to climb out of depression and to give life another chance. For sure, it means that we can exchange war stories and know that the person hearing them knows just exactly what we are saying, even if our chemo brains make us forget the right words sometimes. Once we hear those words, “You have cancer,” we all seem to react differently. I personally took on living with a vengeance. People laugh when they see my calendar. I keep it full. If there is an open day, I generally come up with something to fill it up. I want to enjoy every single minute of every single day. And, for the most part, I am hugely successful in that endeavor. If I am not laughing and smiling and having fun, I just might be asleep! I have many friends who accepted the challenge of cancer and vowed to give it a run for its money!! They are strong warriors and usually spend a lot of time advocating on behalf of themselves and everyone else who has been diagnosed with cancer. They are using the time they have to make a difference in their lives, in the lives of other cancer patients, in the lives of everyone who comes into contact with them. Thank God for these people! I think a lot of us want to give back when our lives have been extended beyond expectations. I wasn’t supposed to live more than 4 months. Wow! I have a story of hope to tell and tell it I will! I know other people who learn they have cancer and it seems like a dark cloud descends on them. They lose their energy and their zest for life. It appears that all they think about is their cancer. Sometimes, these are people who are diagnosed with early stage and treatable cancer. Long after their cancer has been obliterated, they are still giving it power over them. They moan, groan and complain because cancer came into their lives. They feel sorry for themselves and shorten their lives by worrying constantly about the fact that they had cancer … and that it might come back someday. I always wonder, why? Why give cancer so much power? I get it if you are so sick from chemo and/or radiation or surgery that you can’t continue living life. I’ve been there. I lost days of my life when I was getting chemo. I could do nothing besides curl up on the bed, completely miserable and wondering if I really wanted to continue. But, those days would pass in a bit and once more, life was worth living … and live it I did! My own personal perspective is that people who give up the will to live life, who concentrate more on what their new normal means (and what they can no longer do) than on trying to make the best of the time they have, are losing to cancer long before it robs them of life. Here’s the deal. When we dwell on something, it grows bigger and bigger and bigger. It takes on a life of its own. It can begin to consume you. If you’re dwelling on living life, then joy and passion are what consume you. But if you concentrate on what you lost, no matter how small or significant that might be, you give up your peace and trade it for worry, fear, sadness, and/or anger … or maybe all of those. So, I choose to keep my focus on the blessings of cancer. Yes, the blessings of cancer. I joined a fraternity no one wants to be a part of … but now that I am a member, I am not so sure I would ever want to leave again. What??? Am I crazy???? As I noted already, I have made friends that I would have never met if it were not for the fact that I have lung cancer. I wouldn’t trade knowing them, not even if it meant I could somehow give away my cancer diagnosis. I am much stronger than I realized I was. It took cancer to teach me just how much strength I have. Some disease is not going to overpower my thoughts, even if it does try to overpower my body. I have so much more joy than before I was diagnosed with cancer. I guess when I came face to face with the reality that my life could be over in a matter of months, I began to appreciate what’s really important in life. People, moments, memories, time. God’s handiwork. Every single day, every single hour of every single day, I am thankful for the fact that I am alive and enjoying what God has given me. One thing cancer has done is rob me of patience. I have no patience with complainers or with people who can’t look past their circumstances to find happiness. I remove myself from their midst and that has helped make my life much happier! Not only have I made friends with others who share a cancer diagnosis, I learned who my true friends really are: the ones who didn’t just keep on living life without giving me a second thought, but the ones who I know would be there for me the moment I needed them to be. Sadly, for me and for most people who are diagnosed with cancer, I learned that many of the people I thought were good friends really are not. But, the flip side is that I learned who my real friends are. And, that’s a very important lesson. I learned how to enjoy life. I never was much of a worrier. I sure am not now. Worry is a time thief. I have no time to share with worry. Chemo brain has even lent a benefit. Thoughts don’t get a very tight handle in my brain. Sometimes, even most of the time, that can be frustrating. But only momentarily. I don’t hold onto hurts or wrongs … I don’t just forgive them, I FORGET them. Totally. So, they don’t interfere with my pursuit of happiness 🙂 I don’t try to forget them, they just don’t stick in my mind! My challenge to anyone who reads this is for you to begin living life like you might not still be here tomorrow. Because, the truth is, you might not be. A cancer diagnosis brings that fact to the forefront of your mind. But, NONE of us is promised tomorrow (or even the next minute). We need to start living like today might be our last day here. What would be important to you if that was the case? Would you still be mad that someone cut you off in the grocery store line or on the highway? Would which new dress to buy be foremost on your mind or perhaps spending time with loved ones would supersede. Just think about it. Most of what frustrates us or makes us mad is really small in the grand scheme of this thing we call life. We’re giving up blessings every single time we let something rob us of our happiness. Right? Or do you disagree? I am home now from an AWESOME weekend that was spent in Washington, DC at the LUNGevity National HOPE Summit. It is held for lung cancer survivors and their caregivers every year. This year was the 5th anniversary. The event has grown from 17 survivors meeting in a small room to over 150 survivors, plus their caregivers, meeting in a large ballroom. Lung cancer survivors who are attending for the first time are provided with the opportunity to apply for a generous grant that pays for airfare and hotel costs. Wow! What an opportunity!! It was fascinating being in the ballroom with so many lung cancer survivors. We spanned many years. One gorgeous young lady is only 24 … and she’s already recovered from having part of a lung removed due to lung cancer. There were way too many young people there in their 20s, 30s, 40s … and then there were some of us who were older, too. Young, old, skinny, fat … black, white, yellow, brown … cancer does not care. It attacks us all. No matter the age, race, nationality, or religion, the group as a whole was the most cheerful, hopeful group ever. Considering we are fighting the most deadly form of cancer there is, that’s remarkable in and of itself! According to the American Cancer Society publication (link above), 44% of lung cancer patients will survive one year. Only 17% are expected to survive for five years. For late-stage cancers like mine, only 26% survive a year and 4% make five years. I am so fortunate. My traditional chemo regimen quit working about 7 months into my diagnosis. Were it not for the clinical trial I got into, I would have probably been one of the 74% who don’t survive a year. But, because of research and new technologies, specifically, immunotherapy, in my case, I am hopeful I will be in the 4% that are still alive and well five years after diagnosis. But, I disgress … back to the Summit! The packed room was filled with people who were quick to laugh, cheer, and tell their stories. Despite challenges, I don’t think there was anyone there who was not filled with lots of HOPE. Doctors and scientists were hopeful, too! Lung cancer research needs much, MUCH more funding, but even with limited research dollars, the scientists and doctors are making tremendous strides. It is so exciting to hear about targeted therapies that attack just the bad cells and immunotherapy that works by building up the cancer patient’s own immune system so that it can fend off the cancer. Anyone who has ever suffered through chemo knows how exciting it is that there are drugs available or coming soon that don’t send you to bed, wondering if treatment is worse than just dying from cancer. I am sad that I didn’t take pictures at the National HOPE Summit. I was so involved in listening and chatting with others who have “been there done that,” that I never got my camera out of my purse. But, I’ve seen lots of pictures that other people took. And the smiles are infectious!!! People were having FUN all through the hotel! So, LUNGevity is hoping the lung cancer awareness campaign will go viral. I mentioned it above, but wanted to both provide more information for those of you who might wish to participate and to post my first attempt. I decided today that I was going to try to do several. There are LOTS of things that take my breath away besides lung cancer. I’m going to try to highlight several of them. Some of my friends will probably be tempted to start blocking my Facebook posts because they are going to be tired of hearing about lung cancer. But, it is just that important to get the word out. Lung cancer is not a disease to ignore. It just isn’t. To learn more about the campaign, go to http://www.lungevity.org/support-survivorship/lung-cancer-hope-month . Please, please, PLEASE consider participating. The more people who will jump on the bandwagon, the better. I’d be surprised if anyone reading this blog hasn’t been impacted at some point by lung cancer … a grandparent, parent, sibling, or friend or friend’s family … lung cancer is so common that almost everyone knows someone who has or has had lung cancer. No one, absolutely NO ONE, deserves to have any kind of cancer, INCLUDING lung cancer. Smokers are NOT the only people who get lung cancer. Young, athletic people who never smoked are being diagnosed way too frequently. Sadly, doctors are MOST likely to let their cases go on and on before diagnosis … even doctors are influenced by the old campaigns that blamed smoking alone for lung cancer. There is HOPE!!! There is not as much as I wish there was, but there is hope. And if we could get more $$$$ directed toward lung cancer research, that hope would be multiplied many times over. It is incredible what our research community has done with such limited funding. It could grow exponentially if we could get more money to them. I haven’t updated my blog in a long time. How does that help provide hope? It doesn’t … so here i am, hopefully able to provide hope to any of you who have been diagnosed with lung cancer or who have loved ones who have been diagnosed. I was first diagnosed in October 2012. I have passed the critical one year milestone and will see the 3 year mark, God willing, in just a few more months. Trust me, i thank my Lord every single day for my life. So very many don’t make it even a Year. I love being alive and on this earth. Here to enjoy my family, friends, and dogs. But, God is good whether He decides to leave me here on earth or bring me home to Him. Talk about a win-win situation! i just can’t lose! While i am here, i try hard to live every day to the fullest. Fortunately, i feel good, thanks to the immunotherapy i receive every two weeks. Barring bad news from the CT scans i had today, my tumors have remained stable since i began my immunotherapy clinical trial in 7/2013. Praise God! So, what does living look like For this stage IV lung cancer survivor? My dogs continue to dominate my life. They bring me such joy and give me so many reasons to want to live. It is funny to post a snow picture since it is nearly 80 outside on this late March day. But, those two lovers of life get such joy out of the very limited snow we get here in Texas. Cotton also gets great joy in rolling in coyote poop. You can see how nicely she decorated herself in this picture! 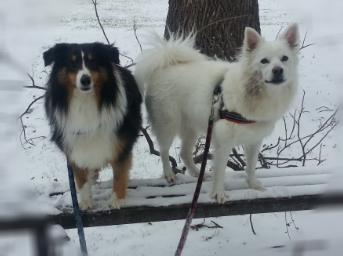 The dogs and i meet our friends Linda and Louie (her precious Pom/Eskie mix) nearly every day to walk. We used to walk at least 3 miles every day. Lately, we have cut that down to around two miles because we come back to a field to practice obedience/agility skills. Linda and I are fortunate enough to be taking agility lessons with Ed Scharringhausen at Run As One Agility. I have taken lots of classes over the last 6 years. Our classes with Ed make all others pale in comparison. We practice the skills he teaches us all week so that our dogs will be ready to move on when we return to class. 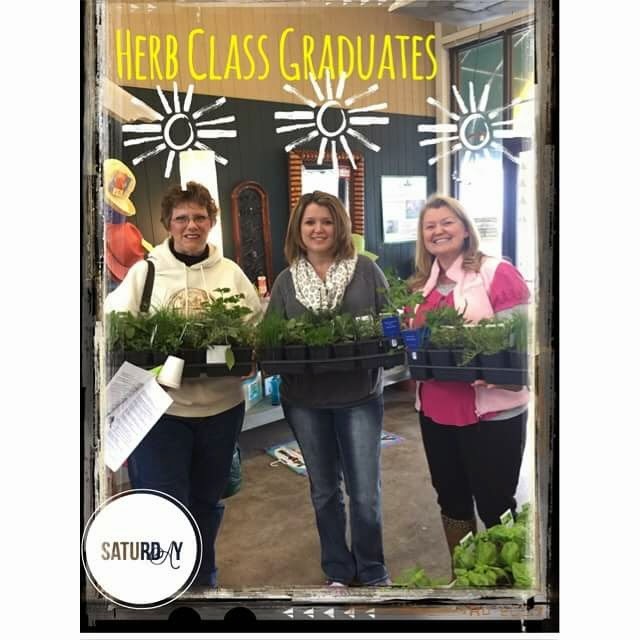 We also take classes with Pam White. Like Ed, she will analyze our runs from trials and is working hard with us to teach us distance and obedience skills. We are so fortunate to have two teachers who put so much into us and our dogs. So, what’s this agility about which I speak so fondly? This is Barney and me running a jumpers agility course. The handler directs their dog around a numbered course. Speed and accuracy are required. Here, the dog must navigate a number of different obstacles. Barney and I LOVE to play agility. As you can see, it takes a great deal of energy. I have not been able to participate in lessons or trials like i did before i was diagnosed. My stamina is not as good and my pocketbook is much slimmer than it was. However, with the current 2 classes a week and, hopefully, at least a trial a month, we are coming back! Cotton doesn’t play agility as much. She’s an awesome agility dog, but she doesn’t always care to participate. Like all sports, it is somewhat expensive. Since my funds are now so limited, i mostly train and trial with Barney, my boy who loves to please and loves to play agility. As you watch the videos, remember it is a stage IV lung cancer survivor running those courses. Awesome, huh? Just for fun, i will post a video of Cotton from the December 2014 trial. First, you will see Barney run the course as designed and then you will see Cotton. Here we go! Formatting restored! My favorite thing to do is spend time with my dogs and friends who also love dogs. But, especially as the weather warms, i also enjoy container gadening, watching the birds, and photography. 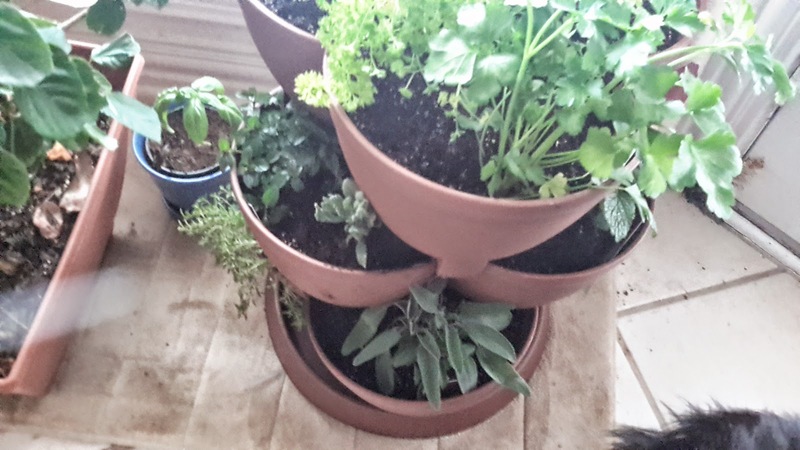 For the first time, i am trying herb gardening. 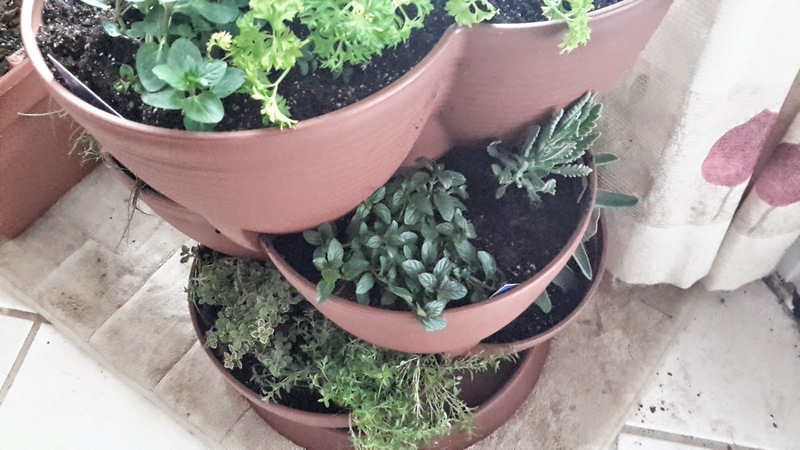 I love my 3-tiered pot. Just bought two more from Amazon … one for mom and another for me. I am going to put some tomatoes and strawberries in the new pot. Not sure what else… i can’t wait to see how it goes! Fresh tomatoes and strawberries sounds heavenly though, huh? I haven’t taken many pictures lately nor have i had time to really spend watching my birds. Soon, the hummers will be back … can’t wait!! Will have to find some time to enjoy these activities. Well, Robert is hungry. I need to end this and get him something to eat. Here’s my final thought : if you have been diagnosed with lung cancer, even late stage lung cancer, do not give up! There is still life to be had. Grab it with gusto! Posted on March 23, 2015 January 4, 2018 Categories agility, cancer, Christian, lung cancer, survivorTags dogs, gardening, herbs, hopeLeave a comment on Still Living with Cancer! The CDC just released its latest statistics for cancer survivors. A survivor is anyone who has been diagnosed with cancer and is still alive. They may or may not still be undergoing treatments. They may have lived 20 years since diagnosis or 20 minutes. The news in the report is actually quite good for many cancer survivors. It seems research has finally gotten a handle on lots of cancers and, while it is a huge inconvenience to be told you have cancer (understatement?! ), your chances of surviving for at least five years are remarkably good. For instance, prostate cancer is the most frequently diagnosed cancer. Over 233,000 men were told they had prostate cancer in 2014. Fortunately, 99% of them will be alive in five years. Caution: 1% don’t make it. Don’t wait around! One of our best friends died of prostate cancer and it wasn’t pretty. The next most common cancer is breast cancer. Pink anyone? (Is anyone else as tired of the pink campaign as i am??) In 2014, 232,670 men and women (but mostly women) learned they had breast cancer. Probably in large part because of all of the awareness campaigns and money thrown at research, 89% of breast cancer survivors will live five years or more. The news goes south quickly from there. The third most common cancer is lung cancer. A whopping 224,210 people were told they have lung cancer in 2014. The majority won’t live a year. Only 17% will live to see that magical five year mark. And yet, funding for research into curing this cancer remains dismal. There is that awful stigma that accompanies a lung cancer diagnosis. It is the smokers’ disease. And, i guess people who smoke or ever smoked deserve to die. And, i guess the thousands who never smoked but get lung cancer deserve it too. i presume this is true because there is so little support for finding cures. I am fighting to change that. So is LUNGevity (lungevity.org). There are two cancers more deadly than lung cancer. Fortunately, they are not as prevalent. Only 6% of the 46,420 people diagnosed with pancreatic cancer will live 5 years. Liver cancer affected 33,190 in 2014. Only 16% of those people will be alive in 5 years. These stats are dismal. It is up to us to fight for change. The more of us who lift up our voices, the better. Look at what awareness campaigns have done for breast cancer. It is time to spread the wealth. Other cancers are far more deadly and those diagnosed with them deserve to have hope and the chance to live for 5 or more years. Please help! If you can’t contribute, you can still communicate the need to Congress and contributors.